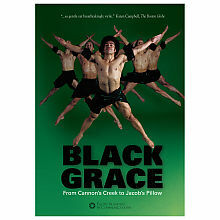 PBS television stations around the country will soon be airing a new documentary on Black Grace Dance Company, Black Grace: From Cannon's Creek to Jacob's Pillow. For the uninitiated, Black Grace is New Zealand's leading contemporary dance company and one of the world's only (other examples, anyone?) companies creating "Pacific-infused contemporary dance." "Art is an important part of who we are as a young nation. Our stories, ideas and expression of these are just as valid and important as those from Europe and America. Why can't a New Zealand dance company be the best in the world? We're the only ones standing in our way." The documentary's PBS mini-site (see link above) features samples from the video of the company in performance, interviews with Black Grace founder Neil Ieremia and Jacob's Pillow Executive Director Ella Baff, and a link to purchase the DVD of the program. So far, I have only been able to find one broadcast of Black Grace: From Cannon's Creek to Jacob's Pillow scheduled for the Eastern Mass., New Hampshire, Rhode Island PBS television axis: WGBH 44 will broadcast the documentary on Friday, June 22 at 5am. I'm guessing/hoping that more will follow in this area. For those elsewhere in the U.S., visit the PBS mini-site to search for your area. The Celebrity Series of Boston will present Black Grace April 17 & 18, 2008, at the Tsai Performance Center at Boston University. UPDATE: My friends at WGBH tell me that the Black Grace documentary will be aired a number of times later this season. Consider June 22 a sneak preview from the National Feed. Stay Tuned!